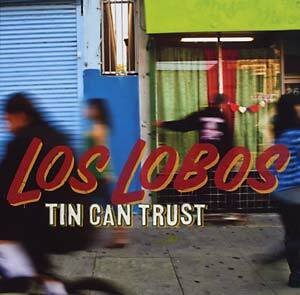 "Tin Can Trust is Los Lobos' first collection of new original material in four years. The Grammy-winning East L.A. band's lineup has remained uninterrupted since 1984, when saxophonist/keyboardist Steve Berlin joined original members Louie Pérez (guitar, drums, vocals), David Hidalgo (guitar, violin, accordion, percussion, vocals), Cesar Rosas (guitar, vocals) and Conrad Lozano (bass, vocals). Seven songs on the album are distinguished and genius Hidalgo-Pérez collaborations, including the opening track 'I'll Burn It Down,' (featuring Susan Tedeschi). Three others were written in whole or in part by Rosas -- including the album's two Spanish-language numbers: the cumbia 'Yo Canto' and the norteño 'Mujer Ingrata' -- and display Los Lobos' signature seamless infusion of Mexican folk songs into rock music. Also included in Tin Can Trust -- a cover of the Grateful Dead's 'West L.A. Fadeaway' -- offering a nod to the bands' shared history that extends back into the 1980s when the Angelenos befriended and opened shows for their northern peers." Gatefold sleeve.